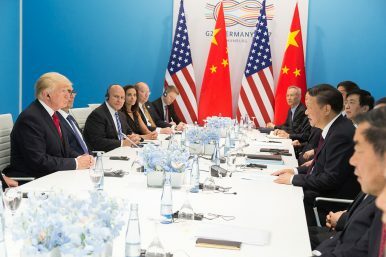 Much has been discussed in media and academia about the emerging and probably forthcoming disputes and confrontations between China and the United States in respect to a series of bilateral, regional and global issues, upon which both sides find it increasingly difficult to agree. This calls to mind widespread concern about an incoming clash or even war between the world’s two leading economies, which stems not only from the power transition underway but from their two different cultures and civilizations. Now the war has come, only in a different form. As the increasingly strong and confident China has grown into a power, one somewhat bewilderingly perceived in the United States as both a “competitor” and a “stakeholder,”the clash has come in the guise of a trade war. What had happened in the 1970s and 1980s between Japan and the United States has lessons for today. Once the Japanese economy was perceived as a major challenge to the U.S. economy and its industrial and financial dominance in the world, trade war measures against Japan were constantly applied by the US government as its strategic response to Japan’s economic “invasion.” As of 1989, the U.S. Trade Representative had launched a total of 24 “Section 301” investigations against Japan. Given the historical fact that the United States had repeatedly applied 301 investigations against Japan, an economically rising power throughout the 1970s and 1980s, there is no reason to be surprised that the U.S. would do the same thing to China. After all, Japan is and was a key U.S. ally in East Asia, while China is perceived as an even more formidable challenger to the United States, economically, politically, and institutionally. The United States, or more specifically Donald Trump’s administration, given the current situation, has little obligation to be benevolent to China and its cooling down but still expanding economy. And so, just as the Americans were nervous or even frightened about Japan’s “dismantling American industry” in the 1980s, this round of 301 investigations against China launched by Trump’s administration is strategically targeting Chinese industrial programs, particularly including “Made in China 2025.” In the U.S. grand worldview, perceptions of other powers — for example Japan and China — may not be changed in short period of time, but perceptions definitely shift when these powers undergo a sharp economic rise. So, why is the United States launching trade wars against almost everyone? Two things may help us to find the answer: first, the specific moment in the historical cycle — i.e., China’s emergence and its industrial challenge to the U.S. — and second, the specific man — i.e., the rise of Donald Trump and his revisionist but nationalist passion that clashes with the long-existed order built by the United States itself. The trade war has begun, but the question remains: Will the United States ultimately win these battles in today’s profoundly multilateral world?